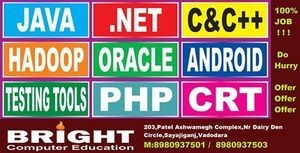 Bright computer education institute is the best institute for computer courses. We have Excellent Faculties, Successful Students, Quality, Affordable Education, Student Job Placement, Quality Facilities and Infrastructure, Student Preparedness for Professional Certifications. We also provide the professional courses like Java, C/C .Net, PHP, Hadoop, Oracle, Android, Testing tools, etc. For more details contact us on 8980937501.